The Mythic 97 is like getting two skis in one! Essentially a hybrid of an alpine carver and a backcountry floater, it has a special feel. Turning on edge feels very solid on hard snow as if it’s running on rails. Get into soft or mixed snow and the generous tip with ample rocker will keep you going fast. It’s nimble through trees due to the short radius yet doesn’t have a problem opening up into bigger turns in open bowls. Best of all it features a lightweight, full-sidewall construction that will keep you slaying the trees and open bowls all day long. A high-performance lightweight ski? Some say that’s a myth. We say it’s a Mythic 97. 5-point sidecut allows you to control the turn shape with a large sweet spot. Carbon-ply construction offers stability at speed without excess beef. Full-sidewall offers durability from impact and impressive edge hold. 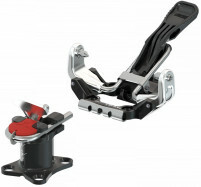 Tip and tail rocker makes it easy to initiate and release from turns. Palownia wood core is the current standard in lightweight fun. Reinforced binding area gives confidence to open ‘er up. Update 2018/19: Just a new topsheet. The Mythic was already ahead of its time. I haven't had the chance to try the Hannibal but I could demo a pair. Currently I have zero g 85s and I'm in the north East skiing firmer snow in the Mount Washington, NH area. I'm looking to pick up something that does a little better when there is actually softer snow but could handle variable/firm conditions as well. The zero g's feel stiff and a bit tinny - I'd like something to be a bit more damp and compliant as well as provide more float. David, Need a bit more versatility. The Hannibal is a nice all around ski. Handles powder, cut up and OK on firm snow. It has just a little tip rise and fairly even flex. The Mythic has a good bit of rocker and a softer tip. But we just mounted up a pair and they even ski groomed resort runs well. If you are looking for more of a powder ski, the Mythic is the choice. Both are versatile skis and either would be an excellent choice. How does this ski compare to the women’s Cham 97. I have the Cham 97 - the tourquoise one. The Mythic 97 has the same shape and rocker as the Cham 97 but with only lighter construction. The Cham is more of an alpine ski, where as, the Mythic has a lighter core for a more focused backcountry use. Hope this helps. Hi Skimo. I’m hesitating between the mythic 97 and the Salomon mtn 95 as a single pair of skis for all my skiing - 90% backcountry, steeps in spring. I’m coming from the old mythic light (89mm, no rocker) and ski the tlt5 boot. Which would you recommend? Hi Rune, you really can't go wrong. They are similar in weight, construction, and profile. The MTN Explore 95 has a longer sidecut and less pronounced tip rocker, which you may find comfortable coming from the Mythic Light. The Mythic 97 has a shorter turning radius and a more pronounced tip rocker which will allow shorter turns and perhaps a bit easier skiing in super deep/breakable crust situations. I'd recommend choosing the ski that you believe sounds better based on those characteristics.